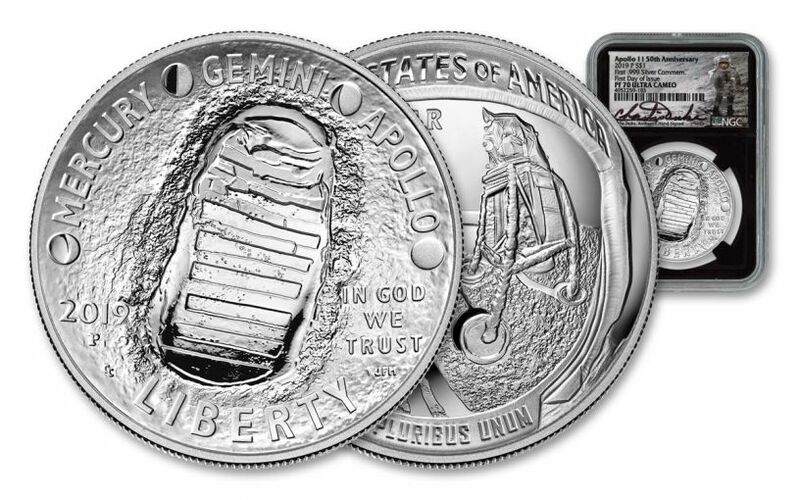 In honor of the 50th anniversary of the Apollo 11 mission, Congress authorized the release of this special, limited-edition commemorative silver dollar. Not just any silver dollar, it represents just the second time in history that the U.S. Mint has struck a coin with a curved surface! 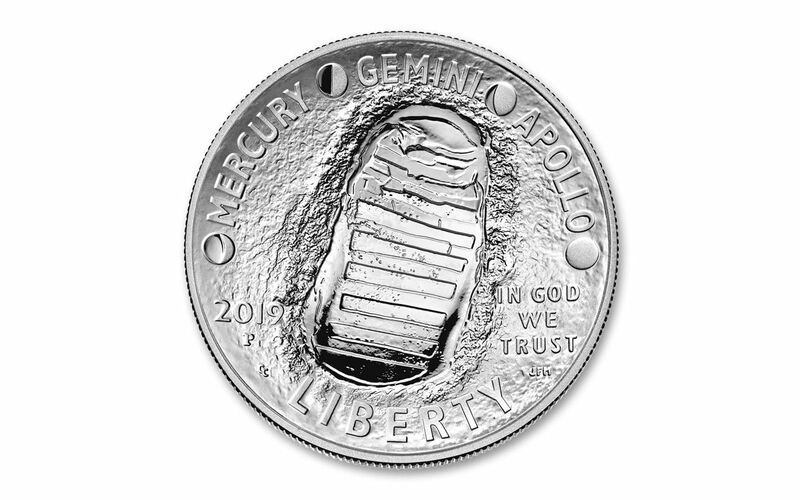 On the coin’s obverse is the indented footprint left by astronaut Neil Armstrong along with the names of the space programs that led to such a historic moment: MERCURY, GEMINIandAPOLLO separated by phases of the Moon. Flip the coin over and you’ll see the outward curve of an astronaut’s helmet. The design recreates a close-up of the famous photograph snapped by Neil Armstrong of Buzz Aldrin. The design recreates the famous photograph snapped by Buzz Aldrin of Armstrong standing next to the lunar module Eagle as seen through Buzz’s visor. The designs are incredibly detailed, and at 38.1 mm in diameter, the coin perfectly reveals every nuance of the intricate details. Struck in 26.73 grams of highly-pure 99.9% silver, your silver dollar has been graded by the Numismatic Guaranty Corporation (NGC) as being in flawless Proof-70 (PF70) condition, a distinction that means your perfectly-graded proof will have ZERO imperfections – showing all features and fields exactly as the engraver and mint intended. In addition, NGC has certified your 2019-P Apollo 11 50th Anniversary Silver Dollar Proof to be a First Day of Issue (FDI) coin, meaning it was received by NGC or an NGC-approved depository by the release date or on the business day within 24 hours of the official release date. 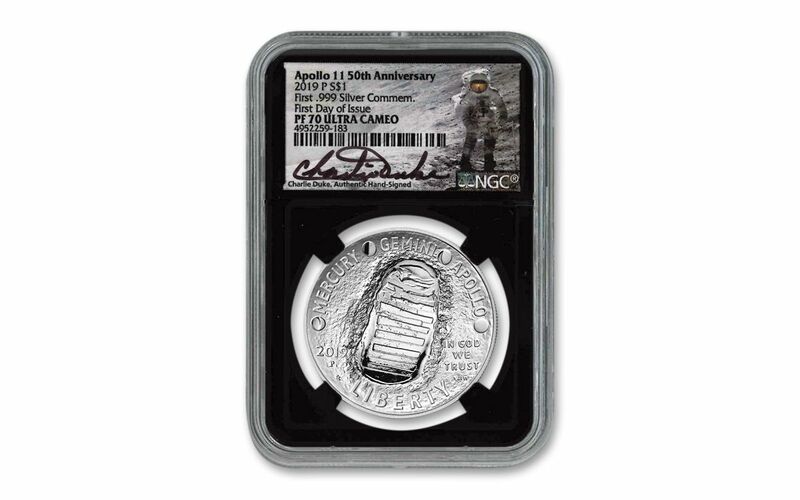 Each coin will come sonically sealed in an acrylic holder sealed with a label bearing the hand-signed signature of astronaut Charlie Duke, who not only served as CAPCOM (Capsule Communicator) for the Apollo 11 mission – meaning he was the voice of mission control for the astronauts—but he later became the youngest person to ever set foot on the lunar surface. With just 400,000 of these historic 2019-P Apollo 11 50th Anniversary Silver Dollar Proofs available, a quick sell-out is expected. In fact, the last time the U.S. Mint released a curved silver dollar was the 2014 Baseball Hall of Fame Commemorative Silver Dollar. That coin had a mintage of 400,000 and sold out in just 13 days! As a one-year-only issue, these curved coins will never be struck by the U.S. Mint again. When they’re gone, they’re gone! Don’t miss this historic release – it’s one small purchase for you and one giant leap for your collection! STRUCK IN HIGHLY-PURE SILVER – These commemorative coins have been struck at the U.S. Mint in Philadelphia in one ounce of highly pure 99.9% silver. GRADED IN PERFECT PROOF CONDITION – Your 2019-P Apollo 11 50th Anniversary One-Ounce Silver Dollar Proof has been graded by the Numismatic Guaranty Corporation (NGC) as being in flawless Proof-70 (PF70) condition. KEY FIRST DAY OF ISSUE CERTIFICATION – NGC has certified your 2019-P Apollo 11 50th Anniversary One-Ounce Silver Dollar Proof to be a First Day of Issue (FDI) coin. It will come sonically sealed in an acrylic holder with a black display core. SIGNED BY A MAN WHO WALKED ON THE MOON – This coin features an exclusive label personally signed by astronaut Charles “Charlie” Duke, CAPCOM (Capsule Communicator) for the landmark Apollo 11 mission. 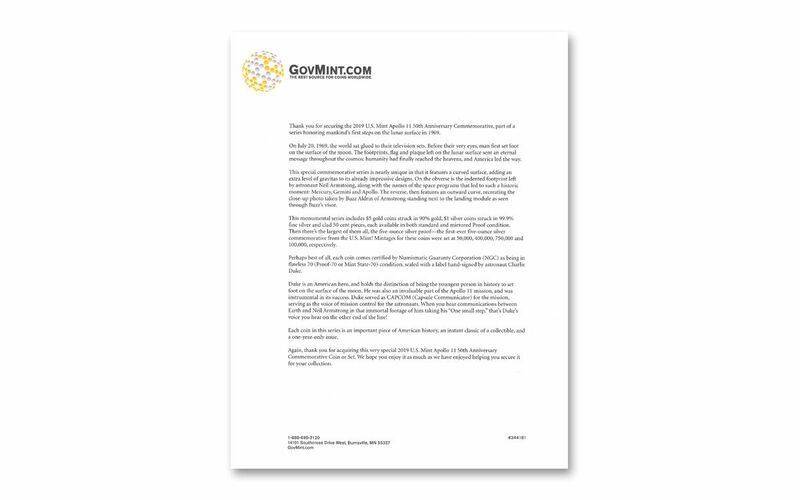 LOW LIMITED EDITION – the U.S. Mint is limiting this release to a combination of just 400,000 proof and uncirculated coins. 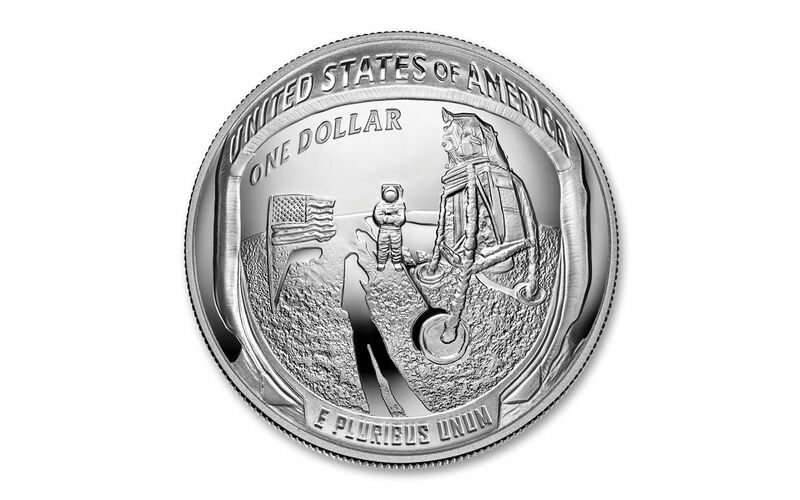 Put the first man on the moon into your collection and honor mankind’s crowning achievement with the 2019-P $1 Apollo 11 50th Anniversary One-Ounce Silver Dollar Proof. Order yours now!